After 17 or so years of using one lens for bird photography (a Canon 400mm 5.6L), I ordered a new lens that arrived Monday…the Canon 100-400mm 4.5/5.6L IS II that I’ve mentioned previously. The timing was fortuitous, as late this week we’ve had something rather unprecedented happen for the area around our little town. We’ve had severe flooding, flooding which is actually supposed to get worse early next week as all the snow pack north of us melts. Splitrock Creek runs through our little town of Brandon, and in the wake of the flooding it has left massive ice chunks all along banks and roads near the river. But it also left scads of dead Asian Carp and other fish. Seemingly overnight, the area around our town has been inundated with Bald Eagles. We actually have an active Bald Eagle nest less than a mile from our house, a nest that’s been used continuously for about the last 6-7 years. 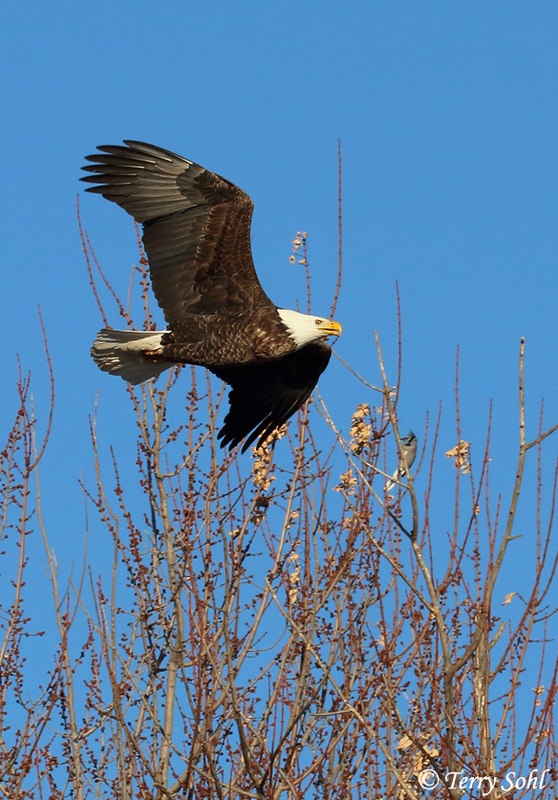 It’s not rare to see one or sometimes even two Bald Eagles while out and about near our town. Today however, I was on a bridge over Splitrock Creek, and from that one spot I counted 29 Bald Eagles. In…one…spot. There have been eagles in varying concentrations all along a 10-mile stretch of Splitrock Creek that I’ve checked out this week. Young (3rd year?) Bald Eagle, flying over Splitrock Creek near Corson, South Dakota. However, it’s not just young birds that are in our area right now. 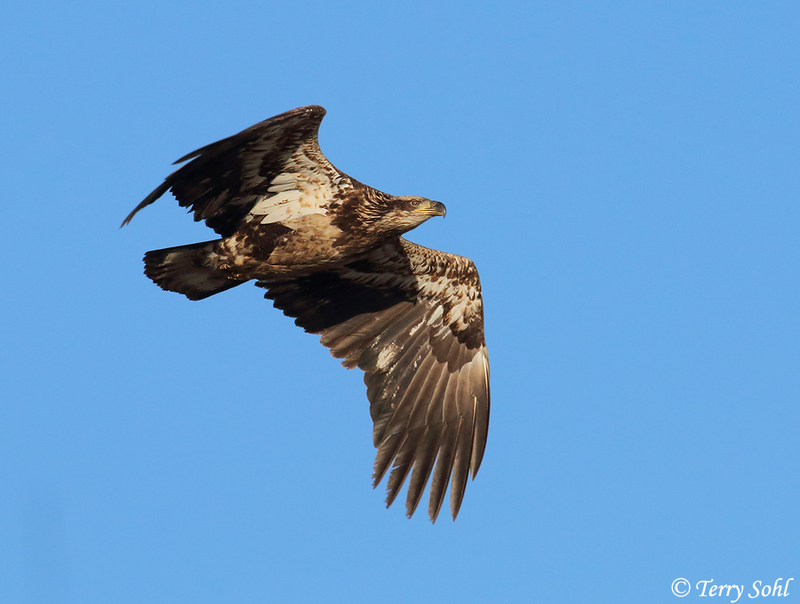 In fact, a majority of the Bald Eagles I’ve seen in the last few days have been fully mature birds. A mature Bald Eagle flying over the trees near Brandon. There were plenty of mature Bald Eagles around, but they were seemingly shyer than the young birds. 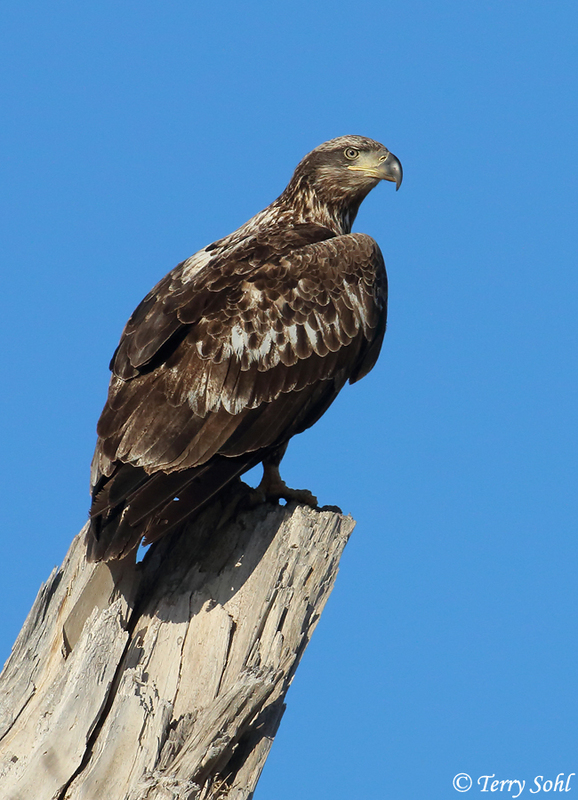 Another young Bald Eagle sitting on a tree stump northeast of Corson. While most birds are along Splitrock Creek, there are so many birds around that they seem to have spilled out onto the surrounding farmland as well. 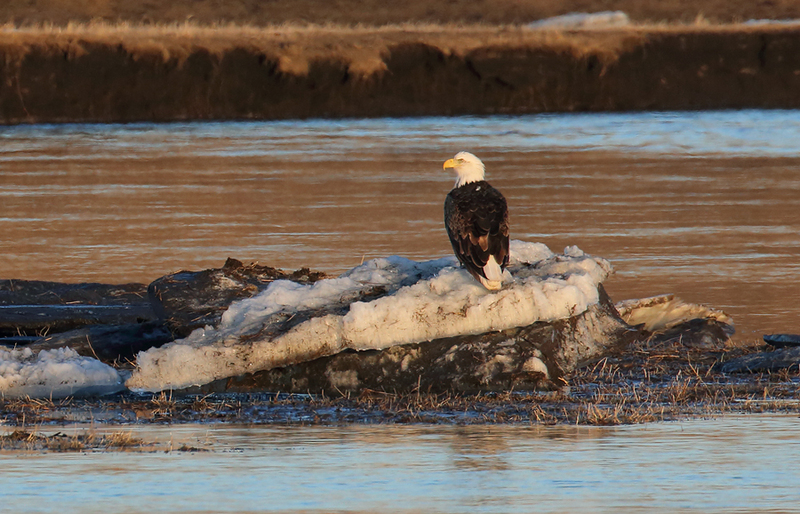 A mature Bald Eagle hanging out on a chunk of ice left behind by the flooding at Splitrock Creek north of Brandon. This is perhaps the most common “perch” for these guys right now, as most of them that I’ve seen have been among the ice flows, where the dead fish are concentrated. 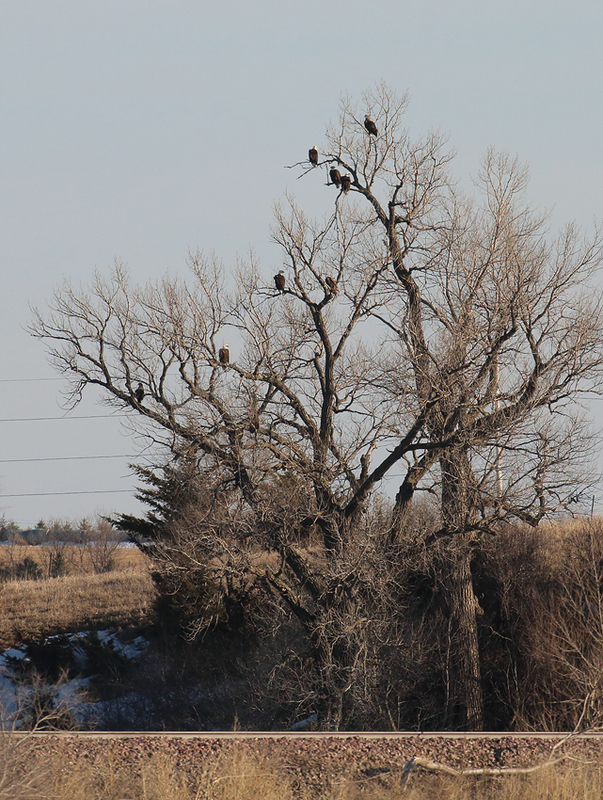 A long-distance shot, but it gives you an idea of the concentration of the eagles. There are 10 in this one shot, sitting on stranded ice blocks on a sandbar in the receding Splitrock Creek. This is the location where I saw 29 birds at once today. An even longer-distance shot, showing a common sight in the trees near Splitrock Creek this week. There are 8 birds in this one tree, but it’s this group of trees where a local farmer told me there were 75 roosting overnight earlier this week. PLEASE – Direct your S.Dakota “bounty” program anger to the right outlet! !